Melt butter then add lemon juice, parsley, and tarragon. Set aside in a warm place so the butter stays melted. Bring six cups of water to a boil in a two-quart sauce pot. Add the lobster tail, turn off the heat, and cover with a heavy lid. Allow the lobster to steep for ten minutes. While the lobster steeps, prepare an ice bath. 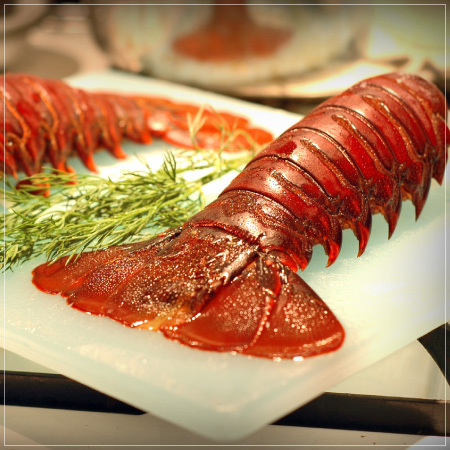 When the lobster has finished steeping, place it in the ice bath for four minutes. Using a sharp knife, cut the tail in half lengthwise. Place the two halves of the tail, meat side up, on a cookie sheet and brush liberally with the herb butter. Place under a hot broiler for three minutes, then remove and set aside. Remove the skins and the pits from the avocados. Place the flesh of the avocados, the lemon juice, and 1/2 teaspoon salt in a food processor with blade attachment. Allow the machine to run for several minutes until the avocado is smooth and has no lumps. Stir in white pepper, to taste. Place in a small bowl and cover with plastic wrap to prevent oxidation. In a medium sauce pan, add three cups of vegetable oil. Warm the oil to 350°F. Set up an ice bath, and keep to the side. Add the cherry tomatoes to the hot oil carefully, and fry for 30 seconds or until the skins begin to peel. Quickly remove the tomatoes from the oil and place in the ice bath for about two minutes. Remove from the cold water and peel away the skins. Place in small bowl and add olive oil and sherry vinegar. Add salt and white pepper to taste. Set aside. Bring vegetable stock to a simmer, and have a six-ounce ladle nearby. In a medium sauce pot on medium high-heat, add the olive oil, and then add the rice. Turn the heat down and lightly toast the rice grains. Add the diced shallot, sweat for 30 seconds, then add 1/2 cup white wine. Let wine cook out, stirring constantly. Continue stirring, and add 12 ounces (two ladles full) vegetable stock, allow to reduce by half. Repeat this process with 12 ounces of stock at a time for about 15 minutes or until the rice is al dente, “to the tooth”, which is a slight resistance when bitten into. Then stir in the manchego, and add the avocado purée, chopped chives, salt and pepper to taste. It may need a squeeze of lemon as well. Lay out two bowls and spoon the avocado risotto in equal portions. Top with six to eight confit cherry tomatoes and the broiled lobster tail. 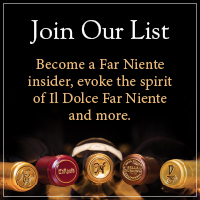 Enjoy with a glass of Far Niente Chardonnay. Bon appétit!